The Buddhist monastery Ajina Tepe (VII-VIII) is located in the Vakhsh valley in Tajikistan, in 12 km. from Kurgan-Tyube town. It was discovered by the scientist Boris Letvinsky in 1960. Much time was spent for the excavations of the monument. As Litvinsky said, the monastery Ajina Tepe tells about the history of the Vakhsh valley, as a part of the ancient country, named Baktria, later Tokharistan. The excavations allowed to understand the historical issues of this part of Asia in a different way. Buddhism appeared on the territory of Central Asia at the turn of a new era. By means of the Asian area China met with this most ancient world religion. Ajina Tepe is translated into Russian as “Devil's Hill"or "Hill of the evil spirit”. The monastery was composed of two square yards, surrounded with holy places, cells and corridors. In one of the yards there was a cult construction – Stupa. Rock paintings and clay statues, as well as 12-meters height figure of Buddha on his deathbed were found on Ajina Tepe. The Indian elements and local traditions of ancient Tokharistan blended in the architecture and decoration of Ajina Tepe. 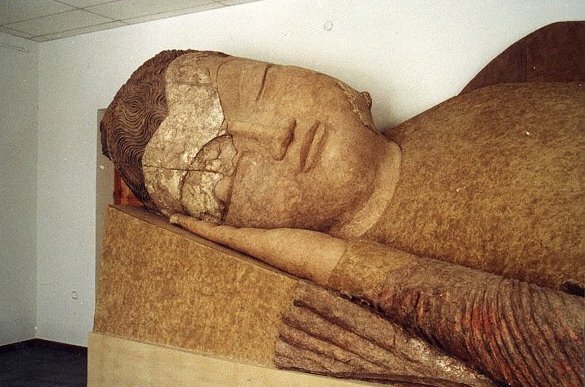 The giant horizontal statue of "Buddha in nirvana", located in the eastern corridor is quite remarkable. Today it is one of the most prominent Buddhist relics in world culture. "The sleeping" giant was divided into 44 parts, was extracted from the cultural layer and transported in Dushanbe, to the restoration and conservation laboratory of the Institute of History, Archaeology and Ethnography of the Academy of Sciences of Tajikistan. The Buddhist monastery Ajina Tepe in Tajikistan was considered the Monument of the World Heritage.